Willie Faulkner chips the ball over goalkeeper Aaron Hogg for Ballymena United's third goal against Glentoran. Picture: Pacemaker Press. Willie Faulkner is happy to play a largely unfamiliar role as he attempts to help Ballymena United kick-start their season. 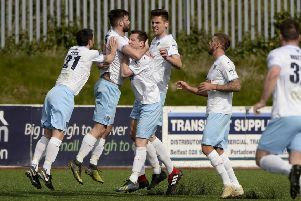 The 25-year-old, who has been deployed in a wide position, weighed in with his first goal for the Sky Blues in Saturday’s 3-1 win at Glentoran. Faulkner was the stand-out player for Ards in their relegation season two years ago when his goal tally reached double figures. “At Ards I was playing more centrally but I don’t mind playing wide if the team needs you to put in a shift. “I wouldn’t describe myself as a naturally out and out winger, I prefer to come inside but I’m still getting into attacking positions. “Hopefully I can bring goals - that’s what wins games so hopefully now I’ve got the first one I can kick on. “There have been a few games where I have got into good positions and then snatched at chances - it’s probably just down to the way we’ve been playing and a lack of composure. “Even at the end when I scored it was a relief because I probably should have had another couple myself but the good things is that we’re creating the chances. “Even the Dungannon game our performance that day was pretty good and if we had scored the first goal we would probably have gone on to win it and against Carrick, even with 10 men for 93 minutes, we probably should have won that game as well so we’re building,” added Willie. “It’s a relief to get that first win and we were outstanding against Glentoran - every single player put in a brilliant shift. “Even from going a goal down - we’ve seen in matches that heads have dropped and there has been a second and third goal - but everybody stuck together and worked their socks off. “It was important to get a goal back as quickly as we did and it gave us a wee boost. “We went to the Oval and nobody gave us a chance at all but we knew ourselves that we have as good a team, if not better, as they did on the pitch. “We just had to match them and then make sure we took our chances. Faulkner admits he’s relishing a second opportunity at life in the top division. “When I was at Ards I had a good year in the Premier League. I had signed another contract and I gave Niall (Currie) my word that I would stay because they did a lot for me and gave me my chance but he always knew if a Premiership club came knocking the year after, I would give it a go. “I probably didn’t have the best year in the Championship last year but Glenn came in and wanted me on board and I couldn’t turn that down. “I spoke to Coleraine and Carrick but I had a good chat with Glenn and I also knew a lot of the boys at Ballymena so that also swayed my decision,” added Faulkner.